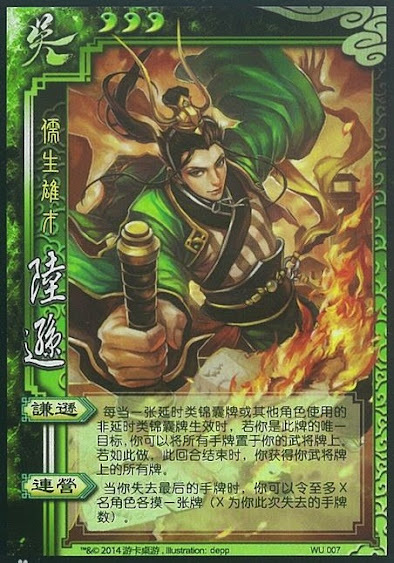 Whenever Lu Xun is targeted with a delay tool or if he is the only target of a tool card, he can put all of his hand cards on his general card. These cards remain there until the end of the current turn, when they return to Lu Xun's hand. Whenever Lu Xun loses his final hand card, he can choose X people and they all draw a card. X is how many cards he had before he lost his last card. Lu Xun can use "Humility" and "Linked Camps" together. When Lu Xun puts his hand down with "Humility", they remain there face down. They are immue to effects from other players powers and cards. Lu Xun can choose himself for "Linked Camps".